Today we have a guest blog post from my uber talented friend, Rae Missigman. 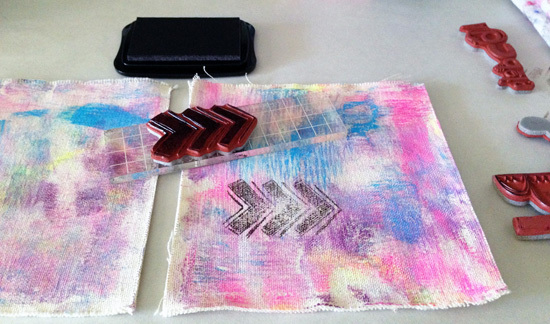 She worked her magic with my Mixed Media Essentials #1 rubber art stamp set and I asked her to create a tutorial to share. I hope you enjoy it! 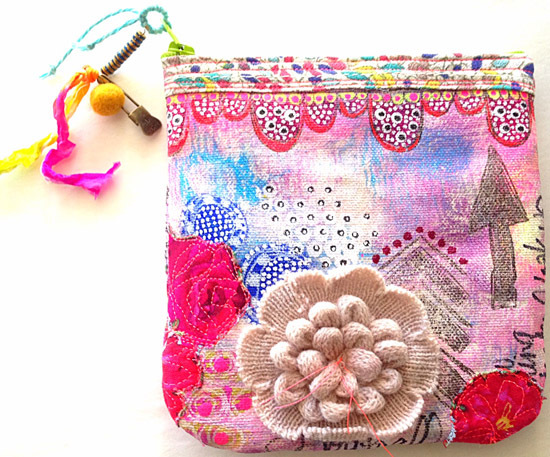 This sweet little pouch is up for auction* as well. It measures approximately 5 1/2" x 6" in size. •Starting bid is $25 which includes shipping within the US - this auction is open to US bidders only. •Place your bid in a comment on this post. Please note that I moderate comments so they appear only after I approve them. •You must include an e-mail address to have your bid qualify. •Bidding closes at 7:00PM EST on Friday, November 15. •If you have the winning bid, I will contact you via e-mail to make arrangements for payment. 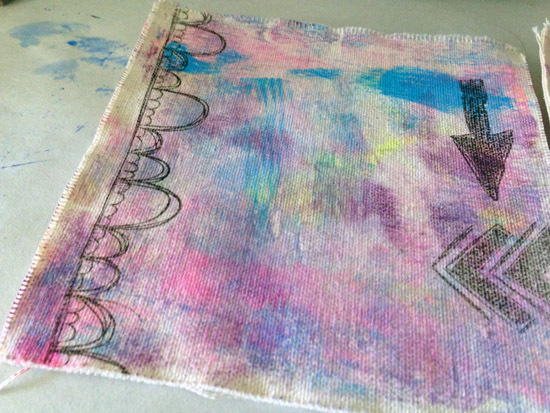 "Stamping and painting on fabric is something I have been doing for a long time- longer than I would like to admit! I think the first time I ever put paint brush to fabric was in the 80's. My father was big into photography and took me to shows all the time, often pointing out how some images were painted on fabric.As a young mother with a camera I was intrigued by this art form. By then I had managed to amass dozens of fabric covered photo albums (you know the ones- lace trim and all, uh-huh, yep, those are the ones). I started out doodling with paint one day and a light went off. 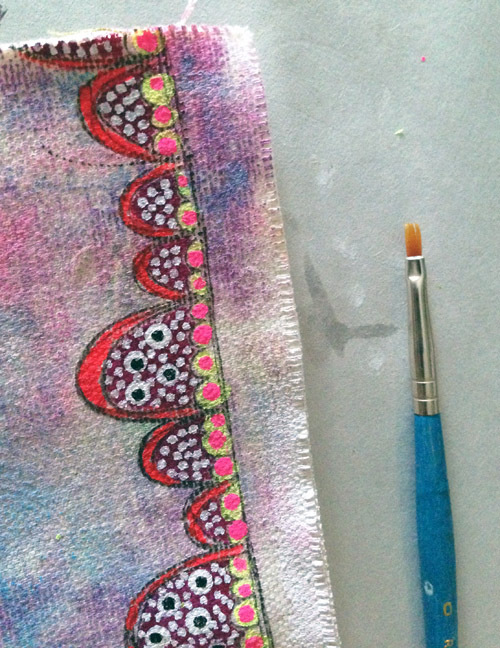 The next thing I knew I was painting each and every one of them with bright and colorful patterns and designs. Well, the albums are long gone, the photos safely archived, but the idea of painting on fabric has long remained. I am not sure if there is anything I haven't tried to paint, but fabric, textiles, are my true love, what I turn to most often when I want to paint something unique, different." STEP ONE - For pouches, I like to use heavy duty canvas or duck cloth so that it keeps it shape and the paint doesn't bleed through. Cut two 6" squares and stitch once around entire square, close to edge, to keep from fraying. Paint a background layer on your squares. This can be as simple or intricate as you like. I used the Gelli Plate to get a marbled looking background on mine. Let dry completely. STEP TWO - Choose your first stamp and position on fabric. Press down firmly and hold for the count of five. Lift carefully. 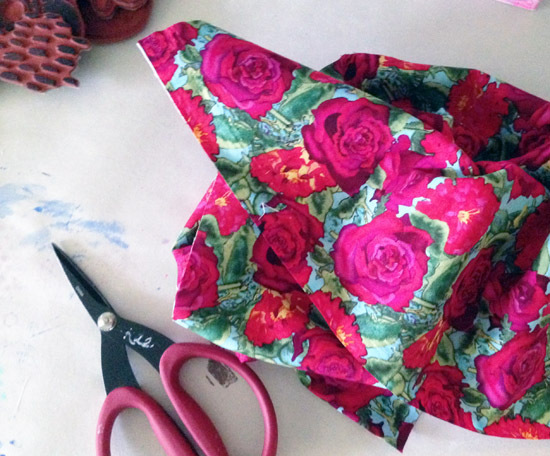 If your table surface allows, it may help to tape your fabric down using masking tape. Repeat as desired on second square, turning your work so that both squares coordinate but are not identical. STEP THREE - Choose a second stamp and once again, position and stamp, pressing firmly and holding for the count of five. Do this for both squares of fabric. 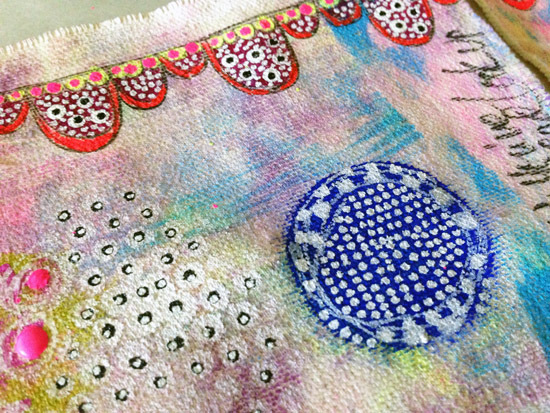 STEP FOUR - Keep adding stamps until you are happy with how your fabric looks, making sure to press and hold each stamp to ensure good adhesion. STEP FIVE - Begin filling in your stamps with paint, making sure to let each section dry before moving on. Do this for both squares. 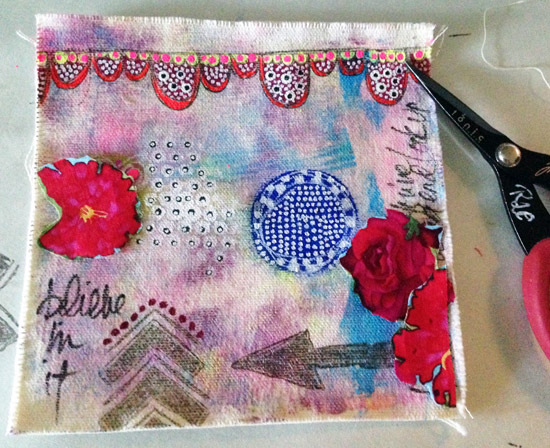 STEP SIX - Once you have filled in all your stamps, begin adding color to your fabric squares, as if it were your art journal. Use paint to draw colorful shapes and fill in. Add pops of white and black using a paint pen. Add some journaling with a permanent marker. Be careful not to make your layers too thick. This will cause your paint to crack later on. STEP SEVEN - Using paint, add details to your stamp work. STEP EIGHT - Cut shapes from your fabric. I like to work with odd numbers, so I chose three for each fabric square. STEP NINE - Position shapes on your squares and pin in place. STEP TEN - Stitch shapes in place. I like to add extra stitching to make the shape really pop. STEP ELEVEN - Stitch an embellishment to one of your squares. STEP TWELVE - Following manufacturers instructions, Iron the 6" pieces of fabric to line your bag to each square making sure to iron wrong sides together. STEP THIRTEEN - Choose your fabric for your seam binding. Cut two pieces. each 6" x 1" . Iron each strip in half and then in half again. Pin to top edge of each square and stitch. STEP FOURTEEN - Attach zipper to squares using a method you are comfortable with. Here is a link for an easy tutorial: INSTALLING A BASIC ZIPPER. With right sides of squares aligned and facing one another and zipper open, stitch up the remaining three sides leaving a 1/4" seam allowance. Clip corners for easy turning. Turn right side out and push out corners if needed. Add a zipper toggle if desired using pretty beads, pins, ribbons and baubles. *Rae will donate a portion of the proceeds to a local charity she has been involved with for a Florida girl who was recently paralyzed from the neck down with no hope of recovery. She is 24 years old and was a world class irish dancer.